The following home decorating style guide in hand table format has popular furniture pieces, decorating motifs and popular materials and colors. Primary dates of influence given are meant as a guide to American historic styles and periods and are not precise. 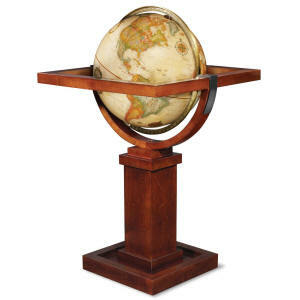 Colonial style, the best of early American decorating, includes Georgian, Dutch Colonial, Adams and Colonial Revival. Learn about capturing the essence of this rich tradition by renovating an existing Colonial or by building new. Mid-Century Modern with its pared down, clean lines is perfect for modern small spaces. Bonded or Reconstituted: material made by gluing leather scraps onto polyurethane and cotton layers. Leather makes up less than 20% of the total. Durahide is a brand name for this product. Frank Lloyd Wright is one of the most influential architects. Wright was born in Wisconsin in 1867. His mother, even before his birth, was determined that he should be an architect. He pawned some of his father's books in 1887 and left for Chicago where he went to work for Joseph Lyman Silsbee as a tracer for eight dollars a week. A year later, he left Silsbee to work for Dankmar Adller and Louis Sullivan. He acknowledged Sullivan as his Lieber Meister (beloved master) and worked for him until 1893. Wright built a home near Spring Green, Wisconsin in 1911. He called it Taliesin, Welsh for "shining brow." In many ways, Taliesin is the quintessential Prairie Style home, merging as it does with the landscape on which it is sited. Through personal tragedies, he rebuilt and continued to develop Taliesin throughout the remainder of his life. Here he formed a fellowship of apprentices who paid tuition and completed projects on the Taliesin buildings. He built Taliesin West in Arizona in 1938. His school wintered there. Over the course of his career, Wright designed the Imperial Hotel in Tokyo, the Johnson Wax Building, the Guggenheim Museum, and numerous houses, including Fallingwater near Bear Run, Pennsylvania. His contribution to affordable housing was the Usonian house; he believed that everyone should have a custom designed home. Wright often designed every detail of a house, including furniture, lighting, and window detail. Some of the most exquisite art glass is found in Prairie Style homes. Wright died in 1959 before the Guggenheim was completed. He is buried at Taliesin. Frank Lloyd Wright furniture was an integral part of many of his projects. His object was not simply to design a building, but to create an entire environment. Furniture, stained glass and fabrics were controlled not by the client, but were defined by his vision and his desire to influence how people would live or work in his buildings. Now a singular example of Frank Lloyd Wright furniture is available in miniature for the furniture lover and design professional. "Wright claimed to build "organic" architecture that seemed to grow naturally out of the surrounding landscape. He believed the internal space, furnishings and decorative details of a house to be intrinsic to its architecture. Many of his projects incorporated site specific furniture and fittings. These unified projects were intended to possess a natural "organic" beauty that would promote the life of the human spirit. Instead of walls, furnishings were often used as spatial dividers, thereby creating more open interiors and a sense of flowing space." "Wright’s preoccupation with geometric forms and intersecting planes in his architecture, led him to develop a similar style for furniture. For example, a series of metal desks and chairs designed for the Larkin Building in Buffalo, New York, were designed to be functionally and visually unified with their surroundings. They were also among the first metal items for indoor use that did not mimic wood. The chairs were made of painted steel with leather upholstered seats and rigidly geometric backs with square perforations. 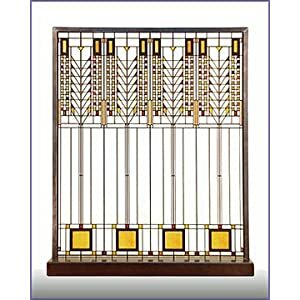 In addition to furniture, Wright designed stained glass windows, ceramics and glass, metalwork and textiles. Wright’s work became distanced from its Arts & Crafts origins as he began to explore the structural and decorative potential of industrial concrete blocks which he used in the design of the Imperial Hotel in Tokyo and four houses in Los Angeles." Frank Lloyd Wright (1867-1959) was born in Wisconsin in 1867. His mother, even before his birth, was determined that he should be an architect. He pawned some of his father's books in 1887 and left for Chicago where he went to work for Joseph Lyman Silsbee as a tracer for eight dollars a week. A year later, he left Silsbee to work for Dankmar Adller and Louis Sullivan. He acknowledged Sullivan as his Lieber Meister (beloved master) and worked for him until 1893. Wright built a home near Spring Green, Wisconsin in 1911. He called it Taliesin, Welsh for "shining brow." He built Taliesin West in Arizona in 1938. His school wintered there. Over the course of his career, Wright designed the Imperial Hotel in Tokyo, the Johnson Wax Building, the Guggenheim Museum, and numerous houses, including Fallingwater near Bear Run, Pennsylvania, and the Usonian house. Wright often designed every detail of a house, including furniture, lighting, and window detail. Some of the most exquisite art glass is found in Prairie Style homes. Wright died in 1959 before the Guggenheim was completed. He is buried at Taliesin. He is the first true modern architect and one of the greatest of the twentieth century. Modern Country style furniture has a worn finish that is immediately relaxing and easy to live with. Many designers show it with crisp white paint and luxury bed linens for just the right contrast. Modern Country or Farmhouse Chic offers all the charm and hominess of country style with updated with contemporary colors and prints. It's welcoming but with a sparer, less cluttered look than before. Worn finishes blend with contemporary for a fresh and interesting take on vintage. Nothing too precious so it's perfect for homes with children and pets, or your cabin retreat.